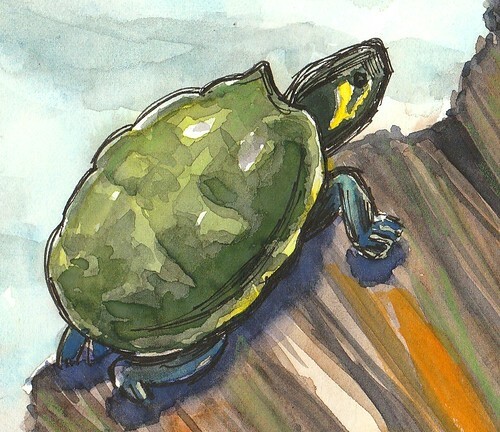 Turtle Without Time Watercolor – Let's Paint Nature! Ahhhh…To live like this one…basking in the sun without mind of time. There’s no room for a watch on his stubby little leg. He sees no second hand, therefore ticking cannot be heard in his ears. It is such a healthy state to be in, without regard to time. I feel most whole when I am in this state, unimpaired and able to connect with nature. This turtle looks like a yellow-bellied slider (Trachemys scripta scripta), but they are not from my area. It is possible someone released it. 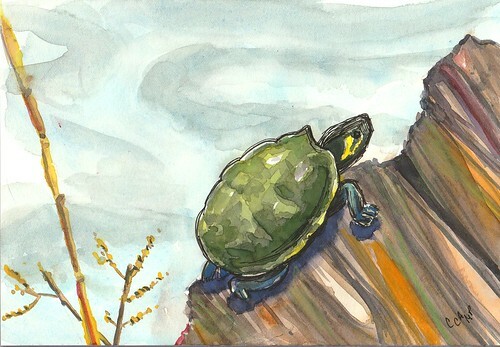 Or it is possible it is a painted turtle (Chrysemys picta) with a strange yellow formation on the side of its head. 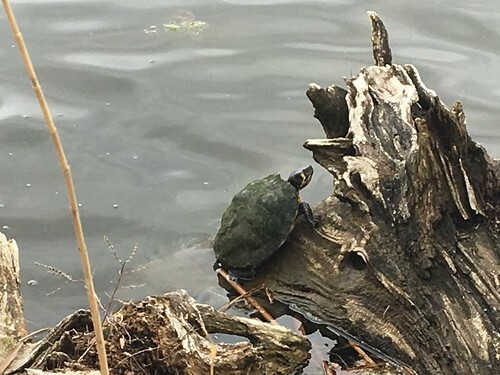 Whichever type of turtle it is, I can learn from it: To take life slow and be in the moment. I simplified this watercolor sketch by removing the complexity of the drift wood. You can do that when you paint because you make the rules.